A swell moment awaits French President Emmanuel Macron on Tuesday in Lagos as he visits Fela Ransome-Kuti’s popular African Shrine. Macron who is expected to arrive in Abuja at about 2:30 pm will depart the Federal Capital Territory for Lagos at 5 pm after meeting with President Muhammadu Buhari at the Presidential Villa. 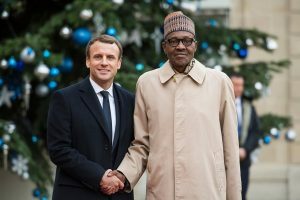 Mr Macron is not a stranger to Nigeria. He trained as a senior civil servant at the French Embassy in Lagos in 2004, seven years after Fela died. At the African Shrine, Ikeja, he will be treated to Afrobeat music. His host, Lagos state Governor Akinwunmi Ambode will use the occasion to promote tourism in Lagos. On Wednesday, President Macron is expected to open the magnificent Alliance Francaise building at 9am. Located in Ikoyi, the building is the biggest and best such facility that blends today’s innovative and classy design with the traditions of the past. This scenic upgraded Chateau-style Alliance Francaise means more Nigerians can learn about French culture and language in Lagos, the commercial capital. This is a welcome development, which is bound to promote greater interaction between Nigeria and France and expand business opportunities, cultural exchange and employment. Later at 11 am Macron is expected to address the Tony Elumelu young entrepreneurs event at Eko Hotels & Suites. The event would be followed by a networking reception at the invitation of the Chairman of Chagoury Group, Mr. Ronald Chagoury. Playing co-host to President Macron as he visits Nigeria will be the French Ambassador to Nigeria, His Excellency Denys Gauer, a seasoned International diplomat who has served in various capacities both domestically and internationally on behalf of the French Foreign Ministry. The story of President Macron is bound to inspire the youths of Africa. It is a fairytale. He was born on December 21, 1977 in the French village of Amiens. He had his primary education in the village and went on to complete his final year of High School in Paris. He obtained a degree in Philosophy from the University of Paris Ouest Nanterres La Defense. Macron left the Socialist Party in August 2015 and launched his own party, En Marche, in his hometown in April 2016.